Just a heads up people, mark your calendars and get the popcorn going for this Sunday night November 2 at 8:00 pm ET for three hours of Mars, the Rovers and the search for aliens on The National Geographic Channel. The premier of Five Years On Mars gets things rolling. Journey with the little rovers Spirit and Opportunity on what was to be a 90 day mission on the red planet that has now lasted nearly 5 years. Using computer generated high-definition photorealistic animation you'll see how the rovers conquered mechanical failures and the harsh Martian environment to send back literally 100s of thousands of images and enough scientific data to keep scientists busy back here on Earth for years to come. Very cool, right near the beginning of the show it cuts to a scene of a bunch of scientists all wearing 3D glasses looking over some assembled 3D images taken by the rovers. Well anybody that has read this blog will know that I am one with all things 3D, ........ I so want a job where I have to wear 3D glasses, I can't imagine... well maybe a little. Intercom system: "ATTENTION! ATTENTION! would Bob Johnson please report to the 3D mission room and bring your 3D glasses with you, there is a lot of 3D scientifical discoveries to be made that will benefit all humankind and we need your expertise and 3D glasses, thank you.... and have a nice day". Immediately following Five Years on Mars will be an encore showing of Life On Mars, then the premier of Calling All Aliens, about how we are reaching out to the heavens in hopes of one day making alien contact, speaking of which do you remember Jodie Foster in the movie Contact? well you'll meet the lady her character was based on, Jill Tarter the director of the Allen Telescope Array. 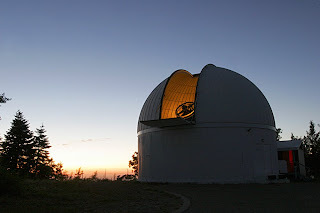 Partially funded by Paul Allen co-founder of Microsoft, the Allen Telescope Array is used by the Search for Extraterrestrial Intelligence Institute (SETI), 24/7 to collect and monitor datastreams from outer space to see if anyone not of this Earth is trying to make contact. All in all a great night with 3 awesome programs you won't want to miss. Right now the Canadian dates and times aren't confirmed, once I find out I will update this post. Also as you're out Halloweening tomorrow night with the kiddies or just out by yourself, look low in the SW just after Sunset for a beautiful gathering of the crescent Moon and Venus. 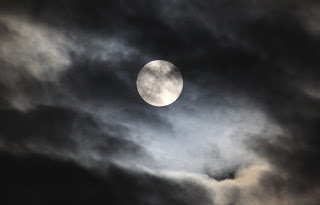 I'll leave you now with an animation of the Full Moon and clouds. Actually I went out just to capture the celestial gathering of Saturn and the Moon, the image below, when by chance I got a cool image of a squashy honking big brown Moon, may not be the proper astronomical terms, but the Moon looked astronomical none the less. Notice the Moon's flat bottom, this is caused by the refraction of the Moon's light back onto itself from all the dust and water particles in our lower atmosphere, kind of bends the light upwards onto itself. 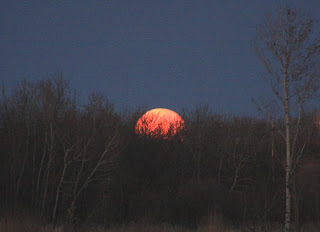 The same particles scatter the blues of the Moonlight and allow the reds through to be seen by us, hence a red brown Moon. 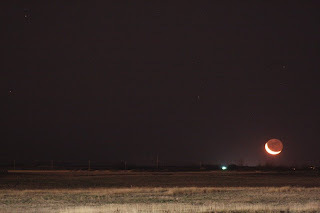 Then we have what we call the Moon illusion, because the Moon being so close to the ground, our mind by comparing it to the Earthly surroundings make the Moon seem very large. 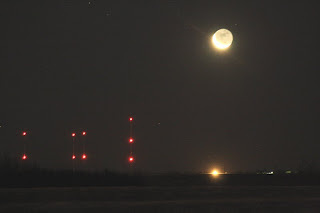 The Earthshine is caused by the Sunlight reflecting off the Earth onto the Moon lighting up the Moon's night side, the bright part of the Moon we see in the images is the Sunlight reflecting off the Moon directly to us, what we call Moonlight. 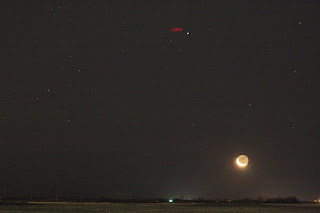 Below are some more Moon with Earthshine images I took on my outing. 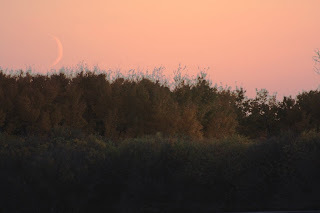 Just a reminder if you want to enter the "Find and Photograph The Daytime Moon Contest" now is the time to take your Pics. 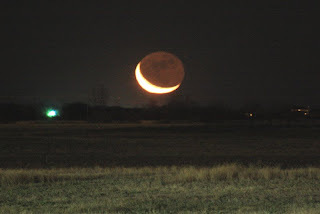 The Moon will be in it's New Moon Phase tomorrow but will start waxing to larger crescents after that, closing date will be November 3rd, lots of opportunity to get your daytime crescent Moon and maybe even win 50 pairs of Hanna Montana/Miley Cyrus 3D glasses, think of the possibilities, all the 3D parties you could throw, great stocking stuffers, boggles the mind. 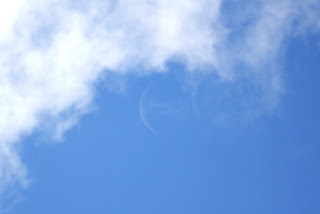 I'll leave you now with an animated daytime crescent Moon complete with clouds. WOO HOO, finally a break in the clouds, mind you it was going to happen between 1 am and 6 am but it would give me lots of time to catch the Orionid Meteor shower and get some pics. Woke up later then I expected, 3 am, no problem, jumped out of bed, had my coat on already, start driving to my spot, drive back to pick up my camera I forgot, get to my spot again, the show was about to start. Set up my camera, grabbed an image of the earthshine Moon, above image, changed lens to my fisheye and start taking pics, all this happening within 20 minutes of me waking up, a new record!!! As I'm leaning against my car in the cold, I had a thought, why not sit in the car out of the cold and take pics, my camera shutter button cable would be just long enough, so I place the tripod right against the passenger side door, enter the car through the drivers side, crawl over the stick shift, my foot hitting the radio button blasting me into the heavens, hitting my head on the ceiling light, I was now officially awake, as I like my music very loud. Then as I was looking at the cameras LCD screen I noticed everything was out of focus, forgot to focus when I changed lens, no problem, I squeezed through the window and car frame to adjust the focus, almost reached the lens focus ring when I got stuck, something on my person got stuck on something on my car, I tried to back up into the car when I found there was no give, alright I thought to myself, I've been in worse situations, time to work the problem. Got one hand in the car after much struggle to find out a string on my jacket zipper had hooked the window handle and had to be lifted up and off, seems easy enough, all this wouldn't have happened if only I would have had the window all the way down, but nooooo, I didn't want to let any cold air in, so I finally free myself get back in the car start taking pictures again and find, gee it's out of focus, repeat everything except this time I open the window all the way and focus the camera. Every October and May the Earth travels through the dust trails left behind by Halley's Comet, as the dust particles smash into our atmosphere at speeds of up to 160,000 mph they excite or light up our atmospheric atoms creating what we call meteors. 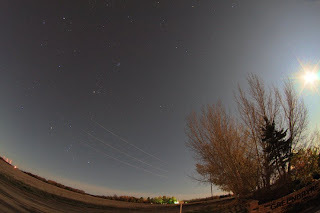 In October we call them the Orionids, in May the Eta Aquarids. 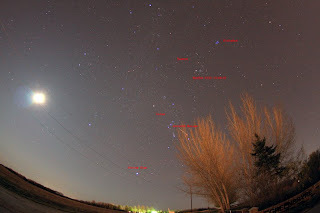 Even with the Moon out I was able to spot around 20 an hour, an excellent showing for the Orionids this year. On average they were small and fast except for a couple, the meteor in the image above, behind the tree was almost like a fireball, lit up the sky. 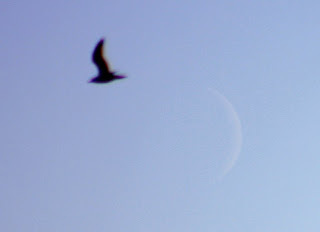 The above image is a daytime crescent Moon, I took this one 5 hours after the above earthshine image, if you're interested in winning 50 pairs of Hanna Montana/Miley Cyrus 3D glasses, and who isn't, now is the time to take a pic of the Moon is in it's daytime crescent phase and enter it in the "Daytime Crescent Moon Contest" closing date is November 3rd. I'll leave you now with an animated image of the Moon crossing paths with a jet. 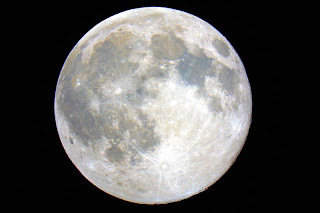 October's Full Moon is called the Hunter's Moon because it provided light to the early Native Americans to hunt their prey in preparation for the coming winter months. Actually the September, October and November Moons hang high and long in the Northern Hemisphere's night sky for a couple of reasons. One is because of our changing seasons the Earth's Northern Hemisphere is starting to point away from the Sun and towards the Moon during it's Full Moon Phase, the Moon is opposite the Sun in the sky at this time, and two, the Moon's orbit around the Earth during these months favors the Northern Hemisphere. So I was able to image the Moon from daytime, to evening wispy clouds, to cloudy skies, to clear skies, all in one night. Winter is fast approaching as well for the Phoenix Lander. 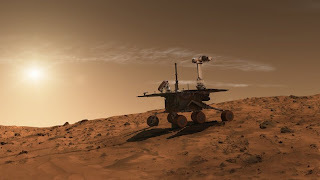 The lander is now working on it's 145 Martian day and is slowly loosing the Sun's energy it needs to power it's instruments as the Sun is setting earlier every day behind the horizon. The lander's robotic arm delivered yet another sample to one of it's ovens for analysis , they are trying to get as much done before the lander finally shuts down. 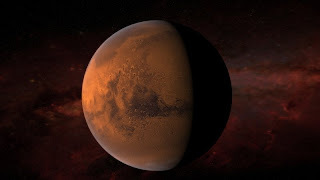 The Phoenix Lander has accomplished a lot, from it's rocket landing, to studying the climate of Mars and seeing falling snow for the first time on another celestial body to actually finding ice water, an extremely successful mission. I'll leave you with a clip I put together of the October Full Moon Rise, comprised of 126 images over a real time frame of 10 minutes. In celebration of the 40th. anniversary of the Apollo missions to the Moon I am going to post some cool images of some Lunar meteorites. You may remember...or not depending whether or not you're a Lunar fanatic like I, Gene Cernans' , the last man on the Moon, words he spoke as he was climbing the ladder of his Lunar Module for the last time, December 14 1972, "America's challenge of today has forged man's destiny of tomorrow" ...well maybe not so much. One only has to look here instead of here to find where our priorities lie. Lunar meteorites come to us courtesy of by chance some other meteorite striking the Moon sending rocks and debris out into space, to be captured by the Earth's gravity, then to strike through our atmosphere as a meteor to land and become a Lunar meteorite. The above image is Lunar meteorite NWA (North West Africa) 4881, found near Algeria in 2005. I love the texture and look of this meteorite, looks like it is covered in cellophane, very otherworldly looking, like it is. The above Lunar meteorite is Dhofar 910, found in Oman in 2003. It is classified as a Feldspathic glassy-matrix fragmented breccia from the Lunar highlands, really all I know is it looks like an icy cratered planet through a microscope. I guess what I'm trying to do by holding Lunar rocks and taking images is hold on to something that has long been forgotten, the days of Lunar exploration. Just in case you're interested, the Orionid Meteor Shower takes place October 20-22, look to the east starting around 11:00 pm on each of those days for the show to start, the Moon will be out as well but you should still see around 20 or so meteors an hour. The video below is a clip I put together of these two Lunar meteorites, imagine yourself in a spacecraft orbiting another celestial body as you are watching it. 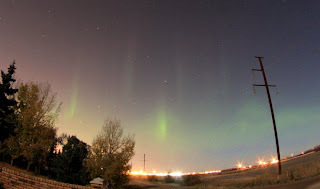 So I was out getting groceries Saturday morning when I got a call from my buddy at SpaceWeather.com, Dr. Tony Phillips. The good Doctor informed me of a large Solar wind heading our way and to expect Auroras. Great, no clouds but we have a huge 90% Full Moon out that night, usually you can't see any Auroras when the Moon is out in full force, takes away the contrast. 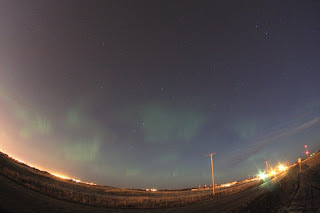 Thought I'd head out that night anyways and much to my surprise I was able to get some Aurora shots. Bonus I took a shot of the almost full Moon and Orion rising in the east, like a sleeping giant come to life, yes our friend Orion is back, so are the cold temperatures he brings with him, man was it cold, -10c, well I mean cold for this time of year, especially since I was wearing a summer jacket. Got some Aurora shots then thought to myself, hey I'll come back after the Moon sets , which was going to be around 4:00 am, I should get some even better shots. At that time the Aurora (above image) was almost over so I thought I'd head out of town to see what I could see Aurora wise, but get this, I ran into a train, yes at 4:15 am I ran into a train, well not into it but you know what I mean. So I'm looking to see how long it is, great not long, it just seemed long because it STOPPED! 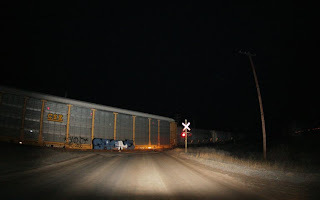 That's right it stopped, got out of the car to take a pic of it stopped, and then guess what happened?, a truck pulls up behind me, all this at 4:15 am. I was going to take a pic of the truck but thought twice when I saw the look on the guys face, about as happy as me. After half an hour of the train stopping it started to move, of course by then it started to get light outside, I just went home. An interesting tidbit of info here, seems they may have just found out why the Auroras dance with the help of the "THEMIS MISSION" or " Time History Of Events And Macroscale Interactions During Substorms Mission" for long, those crazy scientists and their acronyms. To sum it up, apparently the Solar wind's charged particles stretch our magnetic field much in the same way you stretch an elastic band, when the magnetic field can no longer stretch it flicks back the Solar plasma, which they call Plasma Bullets back to Earth, the explosion gives off it's energy in the form of harmless light energy, the crazy lights we call the Auroras. I'll leave you now with a clip of 72 images I took over a time frame of 40 minutes of the Auroras I took that night, I also put a sample message from Dr. Tony at the beginning, doesn't he sound like a friendly guy? 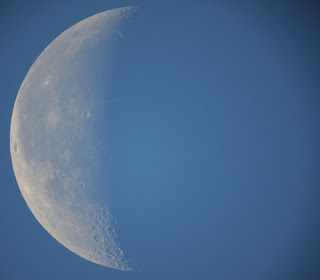 Who hasn't looked to the heavens during the day, usually to see what the weather is like, besides the weather one of my favorite daytime targets is a small crescent Moon. It's fun and rewarding if you can find it as the glare from the Sun makes it almost impossible to spot let alone image. So here's the thing, I will give some lucky person 50 Hanna Montana/Miley Cyrus 3D glasses if you are chosen as the winner by me, my cat and a select few other judges of the "Find and Photograph The Daytime Crescent Moon Contest", Let me tell you 50 3D glasses doesn't even put a dent in my collection. Not only will you receive the valuable 3D glasses estimated to be worth lots but I will post your images on this blog, actually I will post all submissions to my blog, up for the challenge? Hint, some dates to look out for; October 25-27 in the South West. October29-31 in the South. November 24-26 in the South West, November 28-30 in the South. Second place winner will receive a DVD of the coolest movie around "In The Shadow Of The Moon". I can't say enough about this movie, all about the Apollo Missions and the effect going to the Moon had on the Astronaut's lives, and the soundtrack is killer. The best part of this whole thing is if you enter an image, you'll probably be the only one that does, hey, guaranteed to win. To help you out I'll save you some time, the camera settings I used that had the Moon stand out best for the daytime shot were, ISO 100, exposure 1/500 sec. To find out what phase the Moon is in just click on my Moon phase button on my sidebar, to find the location in the sky of the Moon just go to Sky View Cafe and type in your city, it will come back with the location of everything in the sky on any particular time or day for your location. Any questions and to submit your image just email me. While we're on the topic of daytime celestial viewing back in August I got a shot of some crepuscular rays. 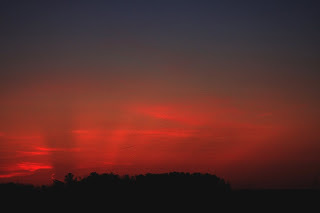 These rays are huge shadows cast into the sky just before Sunrise or just after Sunset by the Sun's rays interfering with clouds, mountains or in the case above, atmospheric interference caused by all the forest fires here in Saskatchewan . We had around 3x the average amount of fires this year as compared to the rest of Canada. Due to the serious and far ranging implications of these fires NASA sent a 120 scientists and a couple planes to the military base in Cold Lake Alberta to analyse their effect on our environment . I got an email from from an intern at GOOD Magazine who thought my readers would enjoy their latest movie production on satellites, I agree, it is very cool. UPDATE: It is confirmed asteroid 2008 TC3 hit the Earth's atmosphere around 750 miles southwest from the projected atmospheric impact area, this was confirmed by an Air France KLM airliner, the crew noticed a short flash just before the impact time. Apparently a few meteorites made it to the surface. 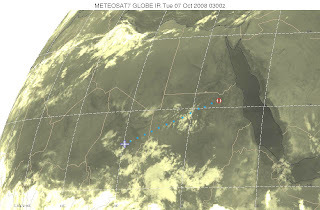 The image below shows the infrared satellite image of the airliner (+) and the predicted impact area (0). 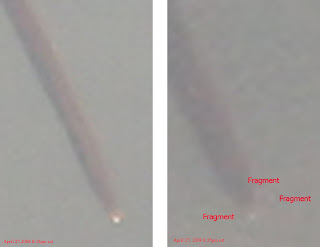 As of right now there are no known images of the Fireball. 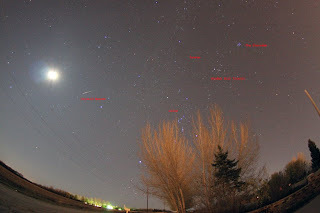 A small asteroid, 2008 TC3 was to have entered the Earth's atmosphere over Northern Sudan creating quite the light show last night, no pics so far, probably not a whole lot of camcorders over there. The above YouTube video is a simulation of what the Earth would look like from the approaching asteroid. As far as the asteroid, nothing too major about that, we get this size entering our atmosphere every other month or so, but what is interesting about this event is that this was the first time someone was able to predict when and where an asteroid was going to enter our atmosphere ahead of time, it's been tried before but with no success. I'm hoping there is more of the same to come, I'd love nothing better then to stand in my backyard with my camera awaiting the next arrival of a new born baby fireball. Now the size of this asteroid ranged any where from a few meters to several feet and is not expected to do any damage if it happens to reach the surface, it's not the size I'm concerned with, I mean it's hard to give an exact size of something that far away, but can we pick a system people, I laid awake last night thinking, ... what was the size of it again? , 3 ft., 3 meters, no it was 10 meters, no 10 feet, geez. The first thing you notice when you get into amateur astronomy is we embrace both systems, I don't have just a 12 inch scope, I also have a 300 mm one, coupled with the fact that I also have a 8 inch 200 mm scope, too many numbers, too many numbers. I've resolved to the fact that my scopes no matter what size make stuff bigger. I'm also finding the older I get the less numbers I can remember so it would be great if we just let the old system go and delve into the metric system, it would make things a whole lot easier. The asteroid what ever size it ended up being was first discovered by the NASA funded Catilina Sky Survey with their telescope on Mt. Lemmon, image above. I will update this post as soon as more info becomes available. 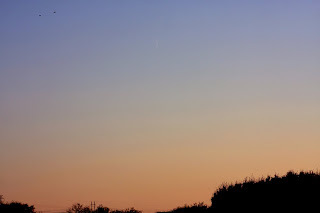 Hey while we're all waiting for some images of asteroid 2008 CT3, I thought I'd post the image below, it is a daytime fireball I was lucky enough to capture while taking an image of a Sunset last April, since it was only a few degrees from the Sunset I was imaging I had my camera equipped with a telephoto lens and focused, got it exploding. On October 6 2008 around 4:40am EDT Messenger came within 125 miles of Mercury for the second time this year. The probe took 100's of images , gathered data and grabbed another gravity assist to slow it down for it's eventual orbital insertion with the planet in March of 2011. Messenger started sending back images this morning around 1:50 am, the image above shows Mercury about 90 minutes after the probes closest approach. A lot of the eastern portion of the above image are views not taken by any spacecraft before. I will update this post as I receive more information. I leave you now with an animated Moon collage I put together with the various Moon shots I have taken with my camera/various sizes of scopes. If you like old black and white Russian documentaries with English subtitles, boy have I got the film for you. Back in February of 1947 a huge meteorite fell to Earth in the Russian Sikhote-Alin Mountain Range. The Russians sent in a crew to retrieve and document the fall, the above movie is part of the documentary. I got permission to put the movie on YouTube from the person who did the subtitles, it is condensed down to nine and a half minutes to fit on YouTube, if you want to download the whole 18 minutes you can go to the originating web site here. The Sikhote-Alin meteorite was witnessed by many people, it made a huge smokey trail and bang that could be viewed and heard for 30 km around the impact zone. The impact made 30 craters and left 28 tonnes of material behind. 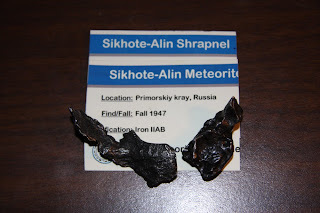 The image above are a couple of actual Sikhote-Alin meteorites, the one on the left is called meteorite shrapnel because it looks like twisted bomb shrapnel, the meteorite on the right is a small individual piece of the meteorite, both were gathered back then. The images above are pictures taken under a microscope of the meteorite at 40 times magnification. Witnesses say it looked like a bright star then turned into a fireball leaving a large smoke trail behind, it entered the Earth's atmosphere at around 31,000 mph. 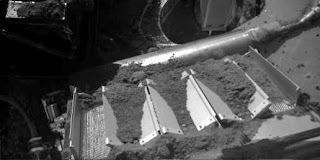 The samples are quite heavy and magnetic as they consist of around 90% iron. October 6 the Messenger Probe will make another flyby of our planet Mercury. This will be the second flyby of our little planet by the probe. Messenger will come to within 125 miles of it's surface to gather another gravity assist to slow it down for the eventual orbit of Mercury in March 2011. 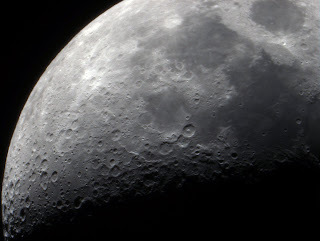 Messenger has 6 major scientific questions to try and answer. 2. What is the geological history of Mercury? 3. 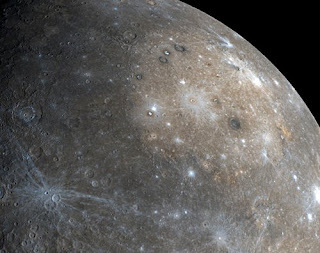 What is the nature of Mercury's magnetic field? 4. 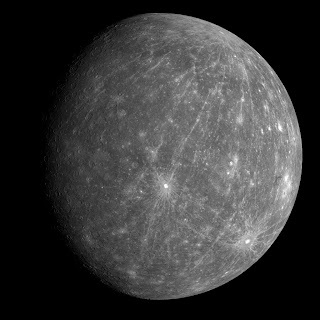 What is the structure of Mercury's core? 5. What are the unusual materials at Mercury's poles? 6. What volatiles are important at Mercury? Once in orbit Messenger will gather data to try and answer the above questions, the mission is slated to last for one year, ending March 2012. I'll leave you now with a Sunset I took a couple nights ago, the Sun is slowly setting earlier everyday, a sign that winter and the minus 40c weather is on it's way, so sad.